1 - I'm obsessed with my brows so actually went to pick up one of these bad boys on Saturday and so far I'm loving it. It's a really unique product with a sponge and gives a great natural look. Please let me know if you're interested in a full review. 2 - Sleek have launched a new illuminating concealer which looks very similar to the iconic YSL touche eclat - I fancy trying this bad boy so may pick one up at the weekend - update to follow. 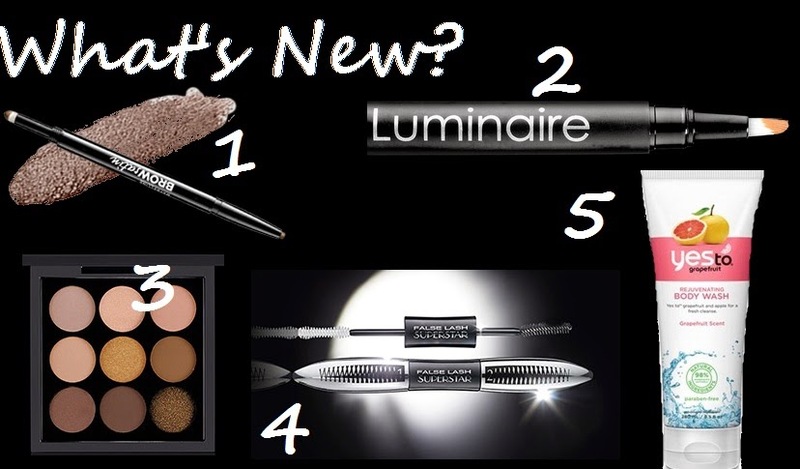 3 - Mac have launched a great new selection of mini palettes for just £30.00 for 9 shadows. My favourite is the Amber Times Nine which are all beautiful shades for anyone with a warm skin tone. You can by this palette here. 4 - In my opinion Loreal does some of the best drugstore mascaras so I'm excited to try the new False Lash Superstar. 5 - YesTo is finally coming to the UK - the range of natural products are due to launch in Boots in July. I'm already eying up what I want to try!! With Wedding Season fast approaching I have pulled together some of my top tips for shopping for the perfect Wedding Guest outfits. I would never buy a dress for a wedding at full price. As formal wear is often timeless scour the sales and pick up a beauty at a fraction of the cost. Below are a few example of some of my favourite bargains on the market at the moment. 2) Don't Get Hat Hair! If you're going to a wedding in the height of summer a massive hat may not be the best idea - there's nothing worse than rocking up at reception with sweaty hat hair. If you are wanting to wear a head piece in the summer I think a fascinator can look super stylish and keep your head cool. Below are a couple of non-hat hair ideas! One of the mistakes I'm sure we've all made at weddings is wearing shoes that kill our feet and being *that* girl in the middle of the dance floor with no shoes on! Nowadays I always ensure that I'm wearing something on my feet that I'm comfortable in! I usually go for a wedge that I've tried and tested. No shoes and weddings are a no go for me. I'm personally loving New Look's new range of comfort fit heels which come in a range of different styles and heel heights. 4) Take a Big Bag! When I say big obviously I don't mean a massive Mary Poppins style bag but remember a wedding isn't a night out and if you're a day guest you can end up being there for over 12 hours! I always make sure I have a large selection of make-up (for top ups), a hairbrush, hair grips, tissues, breath spray, perfume and deodorant which just don't fit in a tiny ornamental clutch. This doesn't however mean your bag has to be ugly - I've selected some big and beautiful wedding appropriate bags below. One of the most important thing's when at a wedding is to think about your make up and the most vital factor in my mind is to hold it all together with a top notch primer. My favourite is by Laura Mercier and costs £29.00. Other than a good primer I'd recommend sticking with your usual make-up that your confident wearing and take along a make-up with you for top-ups throughout the day.